EDINBURG — It was only appropriate that the RGV Vipers rode into Bert Ogden Arena on Sunday on the back of two Edinburg fire trucks. After all, the Vipers were the hottest thing in the G League for the 2018-2019 season. 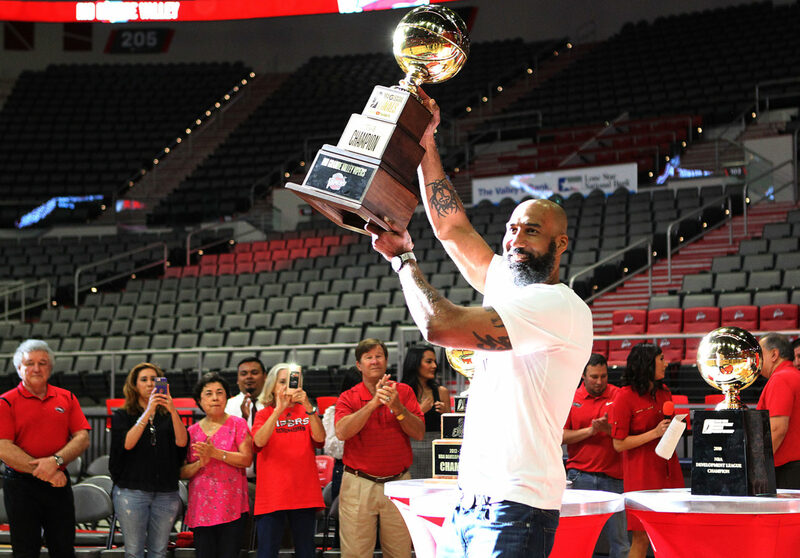 Players, coaches, ownership and fans all gathered Sunday at the home of the Vipers to celebrate the team’s third G League Championship. Each trophy sat on a table in the middle of the basketball court, the newest one taller than the rest as the Vipers paid tribute to the fans and vice versa. Vipers President and CEO Rene Borrego said there was a lot asked of the Vipers this season. They opened a new arena, worked with a new coach and new team — and brought back a title. Coach Joseph Blair, in his first year as head coach but fourth on the Vipers’ staff, said the championship still hasn’t sunk in. The Vipers finished as the top seed in the Western Conference and quickly dispatched of Memphis and Santa Cruz in the first two rounds, which were one-game, winner-take-all playoff tilts. Fans packed Bert Ogden Arena and one official attendance claimed 8,125 fans. It was hard to argue that, especially considering how loud they were. The Vipers ended up having to travel for Game 1 of the G League Finals since they and the Long Island Nets both finished with the same record in the regular season but the Nets defeated the Vipers at the G League Showcase in Las Vegas, giving them home court advantage. Using a unique defense that Blair called “passive aggressive,” the Vipers looked less than contenders in Game 1 of the best-of-three series, falling 117-107. The Vipers won Game 2, 127-116. In Long Island for Game 3, the Vipers made no doubt about anything, leading from the start and taking a 28 point halftime lead. Many of the players had already left for other destinations, but those who were at the celebration included Payton, Jordan Johnson, Dakairi Tucker, Tim Bond, Roger Moute a Bidias, Jacobi Boykins and fan favorite Chris Walker. Before the celebration, players, coaches and staff lined up in the Vipers Den to be measured for their championship ring, which will be created and Josten’s. Blair, among the final ones to be measure, was a 12.5 ring size.